Hashicorp have followed the unix philosophy and created a number of discrete independent tools, each of which completing a specific task very well. 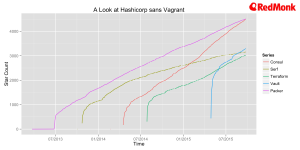 From Vagrant, which is without doubt one of the most frequently used tools in many peoples tool chain, to Vault each tool has filled a need focused around automation. As we have repeatedly said here at RedMonk the more you remove friction, the more developers will appreciate you. Once you set about creating a set of useful products, which can be used independently, or in a loosely coupled fashion, you then encourage all sorts of different types of adoption, across a diverse user base. When you consistently do this well, the effects become obvious. As you can see with each new project the trajectory of likes just increases This is far from a coincidence, each time Hashicorp release a product people sit up and take notice. What I have found very interesting though, is the relationship between different products, and how one becomes a gateway to another, such as how Consul and Terraform have drawn users to Vault. It’s quite easy to dismiss growing “likes” of distinct products to a company having the same set of fans. This is not the case for Hashicorp, of the 20,000 odd unique stars only 1% of users have starred every single one of Hashicorps products on Github.